It’s hard to imagine how a relatively short time span could have a far reaching artistic or historic impact. But the fact is that this phenomenon is quite common in our modern art era. Impressionism lasted only around 20 years. Post-Impressionism another 20 years. Symbolism, Fauvism, Expressionism, Cubism and Futurism—all under 20 years. Even the decorative Arts and Crafts movement was short-lived but broadly influential. 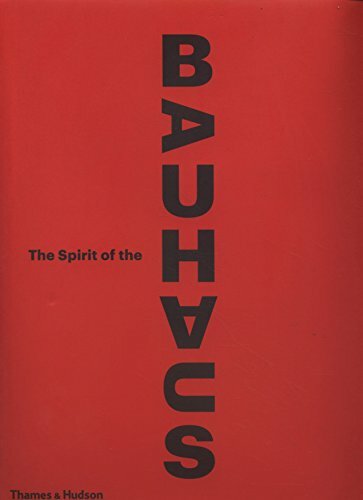 In this respect one of the many contributing essayists, Mathieu Mercer, points out that any discussion of the Bauhaus must first specify which Bauhaus phase it is covering. Based in Germany, the school was founded by Walter Gropius in Weimar (1919–1925) moved to Dessau (through 1923) spent its final German months in Berlin (closed in 1933), and then its premise spread across the globe as its proponents scattered. Groupings of essays cover a variety of themes, each tapping into an aspect of the school as it morphed and moved from city to city and leader to leader. The writings do indeed represent the shifts of the school as it struggled to survive controversy from every conceivable angle. As a whole, the collection gives a sense of the dynamic personalities and strong opinions that threatened the school’s success from the very start. Over the years the range of hands-on and experimental classes included ceramics, cabinet-making, metal, textiles, stained glass, sculpture, mural painting, theater, architecture, photography, and printing, bookbinding, typography and advertising. Like Frank Lloyd Wright, who conceived of the totality of architecture to include furnishings and natural landscape element, the Bauhaus believed that design was all inclusive. Imbedded in the creation of every “thing” was an opportunity to be artistic. Always in the balance was the need for economic practicality versus the foundational priority for artistic innovation. Bauhaus founders no doubt would be thrilled to see just how far their early efforts have traveled. In reaching its 100-year milestone, Bauhaus ideals have permeated every medium, exactly what these artists encouraged. The Spirit of the Bauhaus offers a broad analysis of the ways in which this happened. Little pieces of politics, snippets of art theory, sparks of interpersonal relationships, educational approaches, and economic stresses dangle between over 300 illustrations. The reader will get a sense of wonder at how incredible this school must have been in order to have any lasting recognition amid the backdrop of turmoil and uncertainty.